As you'll recall from part one of day three, South Padre Island wasn't necessarily our original destination. Here we were though heading out onto the island. Don't get me wrong, I was excited about South Padre Island (or simply SPI in the lingo) but it's a big giant island. It wasn't going anywhere. It would be there tomorrow. I was interested in looking for the Fork Tailed Flycatcher but that would have to wait. I think part of the problem was that by this point we were traveling with two other birders and they weren't in on the original late night day planning. The fact that these two other birders were women traveling in Erik's car meant we were especially doomed. As a guide, Erik loves to make people happy and when it comes to the ladies, well, went went to South Padre Island. There was, of course, also discussion of wind. Great Odin's Raven! Birders do love to discuss wind. Curt was of the opinion that we should only go to South Padre Island when the wind was from the North. He was adamant about this. Everyone else thought he was crazy and a South wind was best. This was all discussed very late at night when we were all tired. We tried to argue logically. If the wind is blowing from the South then it will discourage fall migrants from crossing the Gulf of Mexico and they will stack up on the island while they wait to migrate. That was exactly what we wanted. How could Curt possibly refute this bit of birder true knowledge? As it turns out, Curt was less concerned with migrant flight patterns and more concerned with giant pools of frothy human excrement. Fair enough. When birding, both have to be considered. Birders hang out in some really weird places. It's not our fault entirely. Birds hang out in weird places and we tend to follow. My favorite place to bird near Phoenix, Arizona is the Gilbert Water Ranch. It sounds idillic, a "water ranch." This is just doublespeak for a wastewater treatment plant. Birds are attracted to water and where else in the desert are you going to find massive pools of water? Surely this sign is for potential swimmers not birders right? This one was from South Dakota. As expected, good birds, bad smell. The waste treatment plant on South Padre Island is immediately adjacent to the birding center so smell can be a factor. Check out this photo. 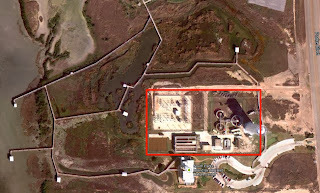 Everything you see is the South Padre Island birding Center with the exception of the area boxed in red. That's the wastewater treatment plant. A north wind may be bad for birding in that it would encourage birds to head south but it would be good because it would blow the fowl smell of excrement away from the boardwalks. We're birders. We'd rather see birds than smell fresh air. I have no idea what direction the wind was blowing but we were headed to the island. Just before we got to the bridge we spotted these two beauties hanging out in the grass. white Ibis for the win! These signs on the bridge also made an impression on me. Cars obliterating pelicans must be a problem. Duh, we don't need flashing lights to tell us to watch for birds. That's why we are here. We arrived at the South Padre Island Birding Center and once again, like at Estero, the staff asks us to please pay when we get a chance. She is very excited to have us watch a film about something. There are expansive mudflats and an extensive estuary just outside the window and I must admit she told me what the film was about but I have no idea what she said. I can't help wonder how many people actually watch it. You've flown half way across the country or around the world to come bird at this site and you can see tons of birds out on the mud flats just beyond the door. Daylight is burning, birds will become more scarce as the day wears on but yeah, let's stop for a film. First bird on the mud flats. Long-billed curlew. There were a few brown pelicans cruising around the island. Very distant Magnificent Frigate Bird. Probably more magnificent up close. The birding center mostly consists of a series of boardwalks and shelters. We saw a good number of species. We slowly made out way around and tried to tease out every last bird. We ended up with 45 species. I aways forget to take photos of the people. Here you go. A Savannah Sparrow made a brief appearance. This Clapper Rail was a highlight. We got surprisingly good views considering the secretive lives of rails. Great Blue Heron. Check out all the colors in that bill! There were birds everywhere. Aside from the birds in the photos, there were Gadwall, American Wigeon, Mottled Duck, Blue Winged Teal, Northern Pintail, Green-winged Teal, Redhead, Pied-billed Grebe, Great Egret, Snowy Egret, Tricolored Heron, Reddish Egret, Cattle Egret, Roseate Spoonbill, Osprey, Northern Harrier, Sora, Common Gallinule, American Coot, Black-necked Stilt, Killdeer, Spotted Sandpiper, Willet, Laughing Gull, Ring-billed Gull, Caspian Tern, Forster's Tern, Royal Tern, Eurasian Collard Dove, Belted Kingfisher, Northern Rough-winged Swallow, Northern Mockingbird, Red-winged blackbird and Great-tailed Grackle. After all those birds we took a little break. Here is Curt taking a photo of me taking a photo of him. We are just feet from massive pools of human offal. Luckily. the winds were in our favor. We finished off the birding center with a Peregine Falcon on the water tower as we walked back to the parking lot. We head to the convention center. We saw some new species there as well. There were American White Pelicans, Semipalmated Plovers, Marbled Godwit, Blue-headed Vireo, Ruby-crowned Kinglets, Gray Catbirds, Tennessee Warbers, Nashville Warblers, Common Yellowthroat, American Redstart, Yellow-rumped Warbler, and an amazing close up look at a beautiful Black-throated Green Warbler. The last bird was a female yellow-headed blackbird. That would be a fantastic number of birds for the day but we had this crazy idea to keep birding. After all, there was still sunlight. Why not? The rest of the day will have to wait for part 3.